Two beautiful wedding invitations for those gorgeous Eastern Shore weddings. Classic, elegant and timeless...a combination that is beautiful in every sense of the word. Devin and Kevin's invitations were truly stunning. While their save the dates were super fun and whimsical, we went super classic for their invitations. A custom monogram that was not only printed on the belly band in gold foil, but also used as a blind hit on the letterpressed invitations. Stunning! Absolutely thrilled with Candler and Cory's wedding invitations. A true southern bride, these invitations were classic and timeless. A beautiful letterpress combination of silver foil, gray and the palest blush with a hint of peach...they were stunning. We had the pleasure of designing Kim and Chris's stationery for their big day in Philadelphia at the Crystal Tea Room. 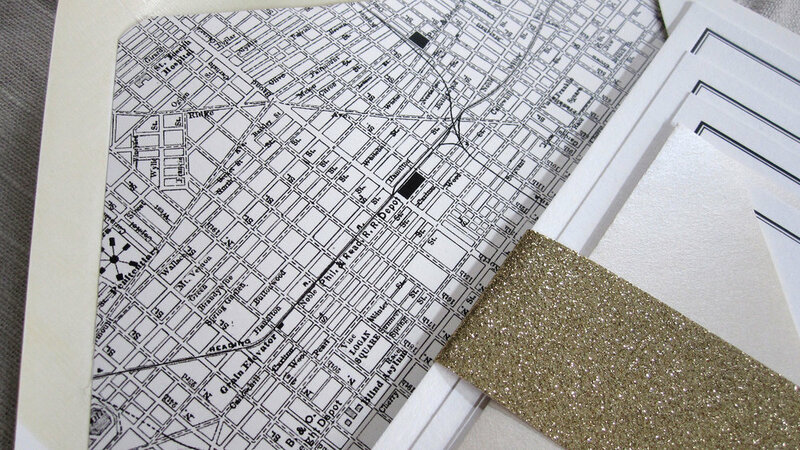 Based on our Charm City Collection design, we tailored every detail to the city of brotherly love.Each card incorporated an iconic landmark around the city, complete with a vintage map of the city for the envelope liner, tied together with a gorgeous gold glitter belly band. 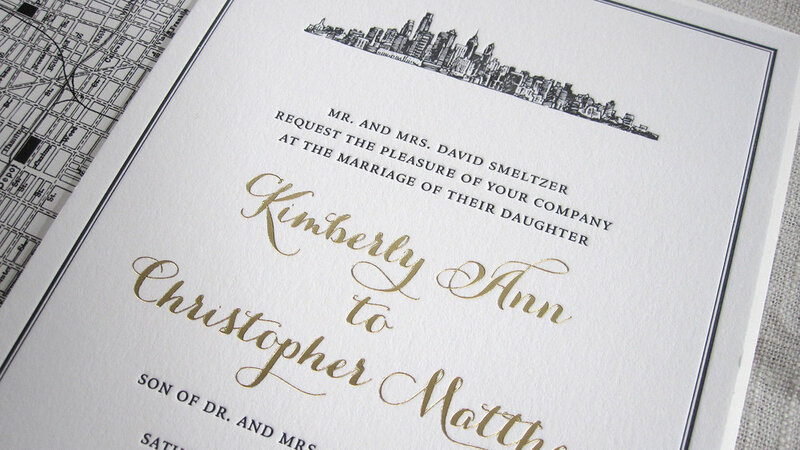 A beautiful combination of gold foil and black letterpress. 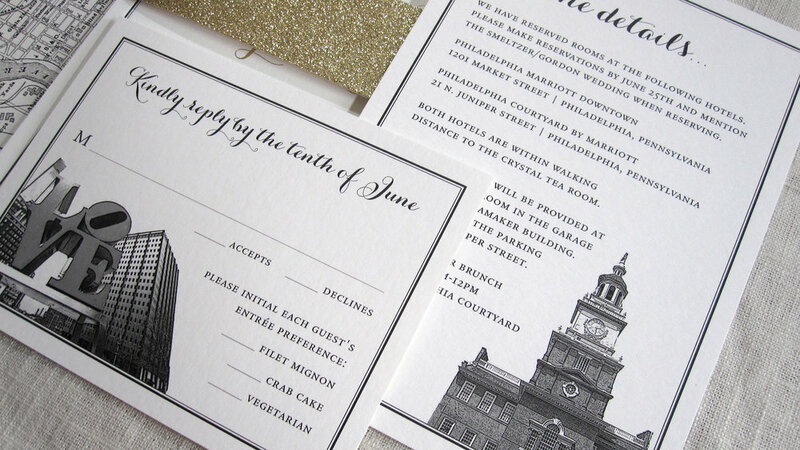 While our Charm City Design collection is hugely popular, and as much as I love my hometown, there is something special about these lovely letterpressed DC wedding invitations. Even in different color schemes and iconic images, the suite looks stunning. 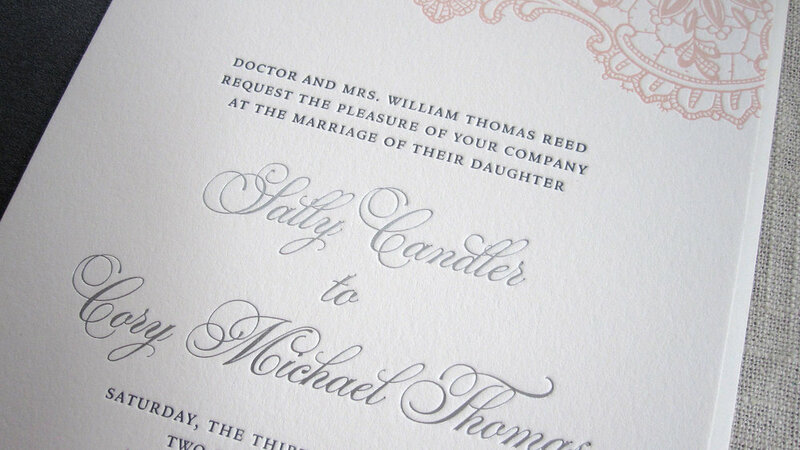 A few recent shots from a few gorgeous letterpress invitations. And my all-time favorite save the date! So thrilled with how Marsha and Carl's Save The Dates turned out. We brainstormed a few ideas and she happened to see a similar save the date I designed for a June couple and fell in love with the design. While having a destination wedding, they wanted to bring a more formal aspect to the stationery. A bit playful and whimsical, with a formal flair. Can't wait to share pictures of their invitations in a bit! Sharing a few details of May and Scott's wedding invitations from their wedding just a few weeks ago at The Oaks Waterfront Inn. Really loved this couple. Both are architects so they each had a great sense of design. And you have to love a couple who loves rose gold foil and blind hit letterpress. We incorporated a custom map of the Eastern Shore as their envelope liner with a little heart over The Oaks with their initials. So thrilled with how their invitations came out! 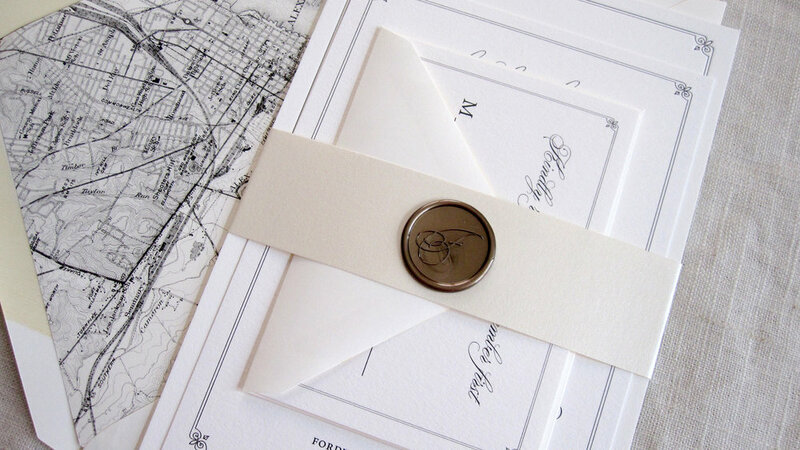 An oyster shell set the tone for these gorgeous invitations. While the challenge was finding the perfect oyster shell for Katherine and Mark, once we did, all the pieces fell into place. The wedding would be an outside affair at Brittland Manor (of course with an oyster shucker) so we aimed to pull that Eastern shore, oyster shell, watercolor vibe throughout all the pieces. One of my favorites from this summer. We are thrilled to have created some beautiful invitations lately for some fantastic clients. 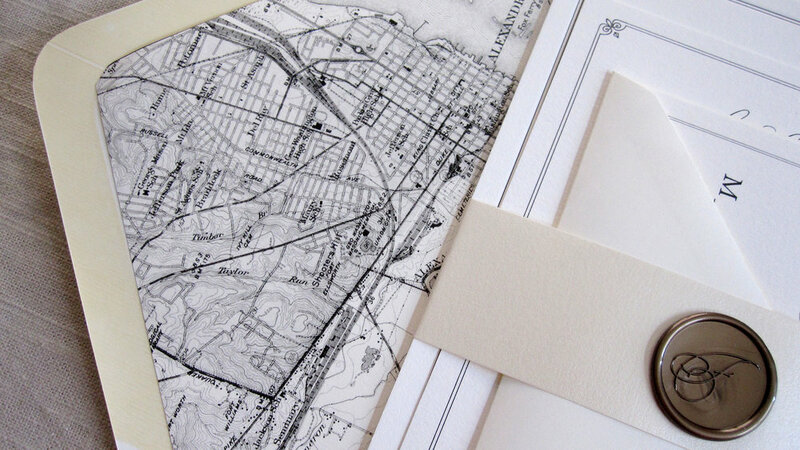 Ranging from letterpress invitations with coordinates for a destination wedding to invitations with a wood grain patterned stock, no two invitations are the same, just like every couple we work with. Another beautiful invitation today from Julie and Ben's wedding this past May. I LOVED working with this bride! So sweet, so down to earth and had a unique vision in her mind which I had the pleasure of designing. She initially came to me with an art deco image she loved, but wanted to incorporate a bit more of a floral nature. So after some research, we came up with the perfect artwork and paired it will a metallic gold rose pattern envelope liner. Every detail was perfect. It's a great perk of the job designing invitations for incredible couples. It's an even better perk when you know the couple. Thrilled to have the opportunity to design invitations for an utterly amazing couple, Chris and Beth. A perfect match, and one that we couldn't be happier for. With a theme of "meant to bee" (perfectly suited for this couple by the way), we designed a suite full of gorgeous and whimsical birds, flowers and birdcages. To bring in their spring color palette, we printed each card in one of their colors. True perfection.